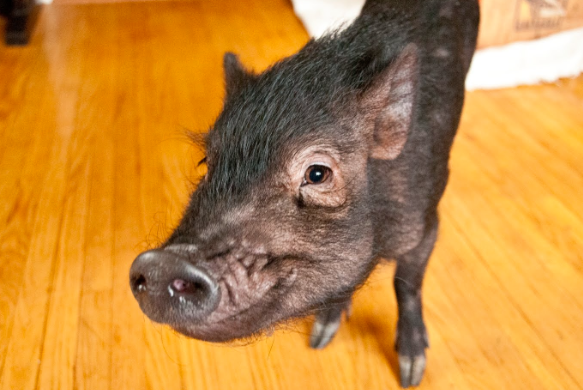 Body scoring and mini pigs: What are the signs of an unhealthy pig? 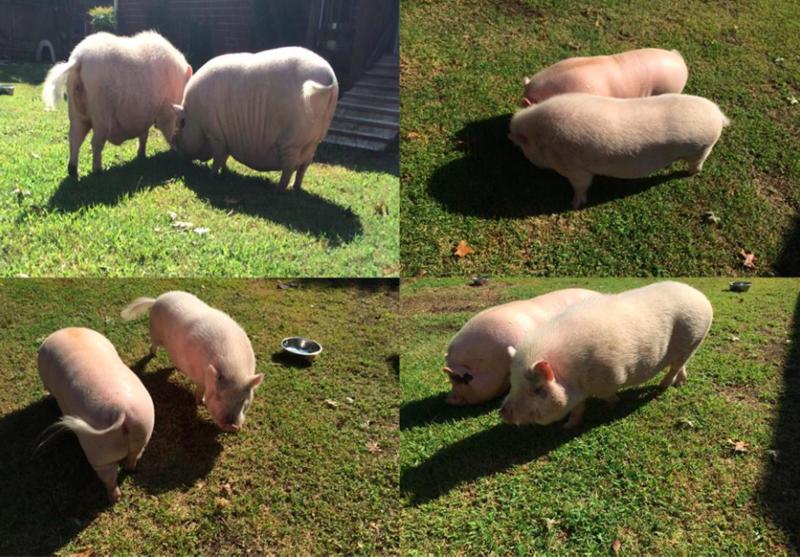 What does a healthy versus unhealthy pig look like? Below are picture of both overweight and skinny pigs (yes there is even a photo of MY pig when my vet said she was healthy and no matter how much I fed her she didn't gain weight). Since we can all figure out what the overweight pigs are we aren’t going to talk much about them other than they can be equally at risk. Pigs that are overweight can have serious joint and internal problems due to the excess weight and can often times go blind due to excess fat deposits around the eyes. If you feel you need help getting your pig down to a healthy weight (IF OVERWEIGHT) please talk to your vet about what you can do to place your pig on an exercise routine and a diet. Now, here comes the tricky part. 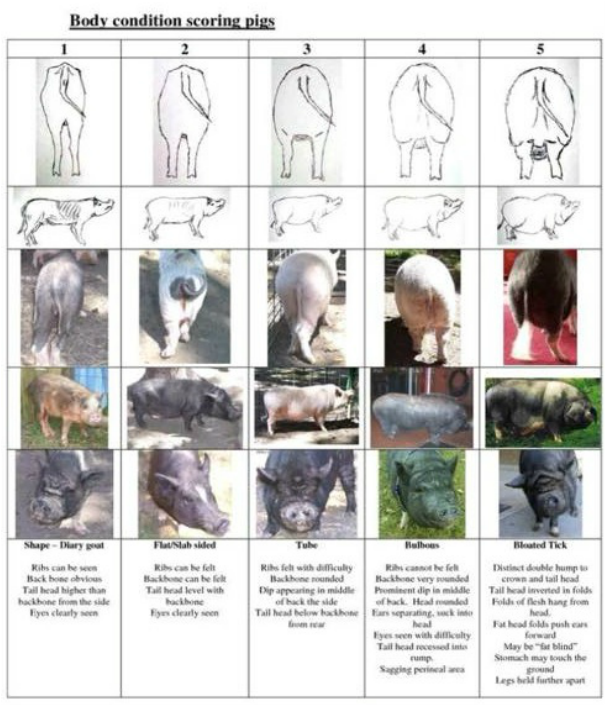 I highly recommend everyone take the time to read these simple things that can identify that your pig might be underweight. Im going to share with you a personal experience to show you how easy it is to miss signs. I have been a pig mom for almost 3 years. I am a part of several pig groups, admin to several, organize pig events, so yes I am clearly involved in the pig world. I never felt that my pig was “underweight” per se, but knew she could always gain a few lbs and it wouldn’t make her overweight. I remember the exact post in a piggy group that made me take a DEEPER look at my pig. 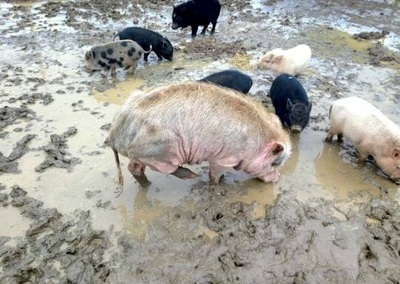 I knew that I was following my vet and breeders (even though he is a joke) recommendation about what to feed my pig. I was feeding her the recommend 1/4 a cup twice a day with a salad, fruit, or veggies as a snack. Of course she got the cherrios and other special treats but, I never withheld food to try to keep her small. I thought I was doing the right thing by following my “well experienced, person who doctorates and specializes in pig” orders. So a post went up bashing someone in a group for having a pig that was clearly underweight. Looking back now I think everyone jumps all over each other because deep down we CARE. But something about this post hit home. 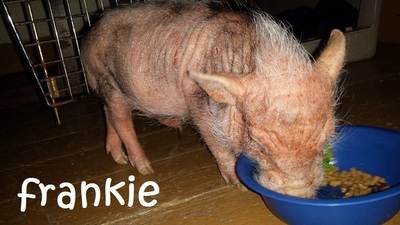 I took a deeper look at my pig and although my vet says she is the perfect size, I made the decision as a pig parent to change how things were going with my pig. It wasn’t about my pigs spine showing or hip bones, neither of those showed. It was the things I had to look deeper for that made me realize that I needed to do better for my pig. 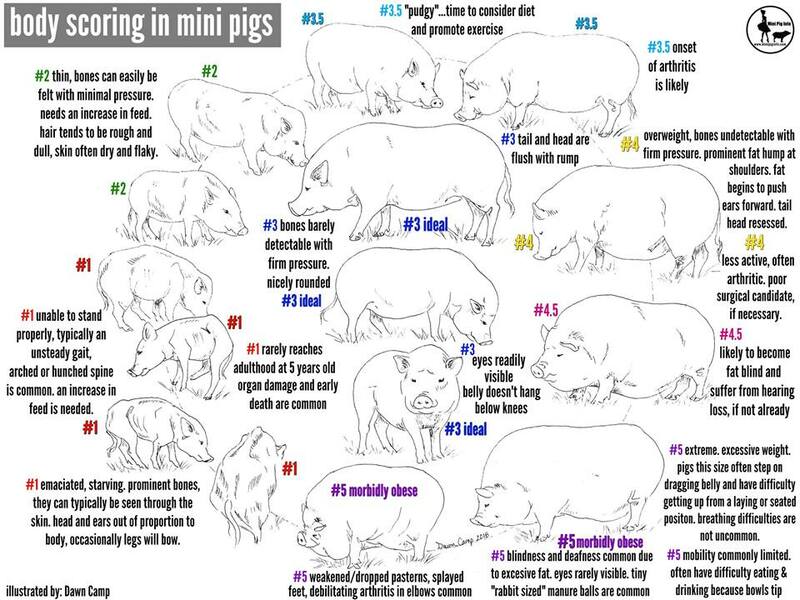 Here is a list of some of the things that you can look for for signs that your pig is under weight. If you see a pig, but the pig is constantly dressed in clothes, odds are the owner knows the pig is underweight, the pig is probably always seeking warmth because of the lack of body fat to keep them warm. It's sad, but we see it everyday, especially on Facebook. -Resting their head on objects *this is a huge thing for me that made me think, wait, MY pig does that! -Some pigs gait is affected by the malnourishment and they're not able to walk straight, often falling or they have a walking disorder such as goose-stepping due to vitamin/nutritional deficiencies. ​-Bones visible through the skin. You should not be able to identify the skeletal structure just by looking at a pig. Just because 1/2 a cup per day for every 25lbs of pig is the recommend serving size doesn't mean that that is the recommend serving size for YOUR pig. Just like humans some people need more food than other and some people need less food than other. Well I'm here to break it to you, this is true for our dear little piggies as well! Take into consideration their activity level also. 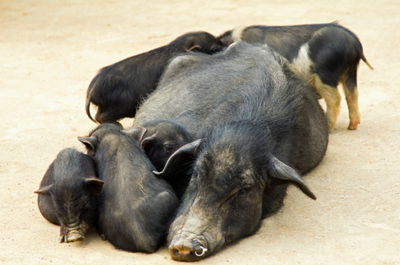 Pigs that are underweight can have a shorter lifespan. Why not give your pig/pet/family member the best chance possible to live the longest and healthiest life? Don’t take offense to this post or think to yourself MY VET SAID SHE/HE WAS HEALTHY (my vet DID say this). Your vet sees your pig for 15-30 mins once or twice a year when you see your pig every day. 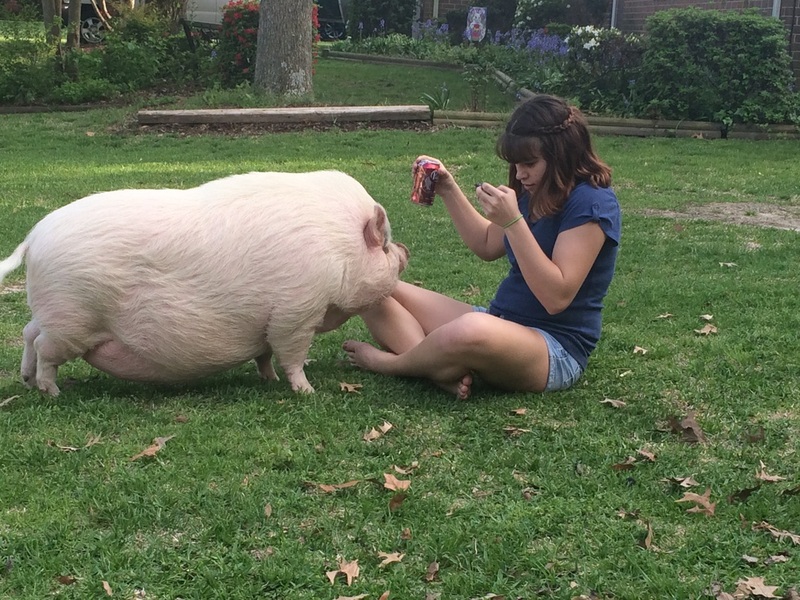 Be the responsible pet owner and look for signs that your pig might need an extra 5+ lbs. 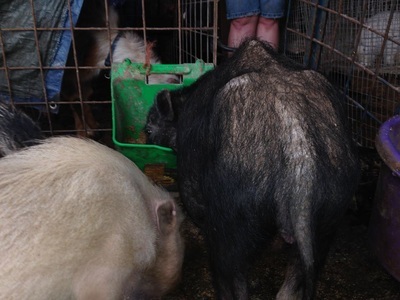 Don’t hope that they will stay SMALL and overlook the unhealthiness of your pig! Your pig matters and if they could tell you how they don’t feel good they would! Smaller doesn't always mean better or healthier. If your vet is incompetent, find another one. 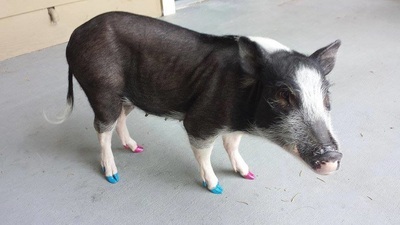 This is the last pig pictured above. He was being cared for by Cedar Row Farm Sanctuary as of Jan 2014. I hope to find more pictures of Wilburt to show his progress. On the opposite side of the spectrum is overweight pigs. Overweight pigs are much easier to identify. 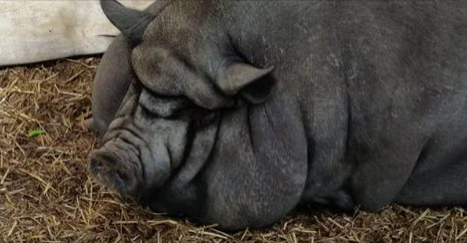 Bellies dragging the ground are only one example of what an overweight pig looks like. You can't predict how big your pig will get and the height and length is predetermined by genetics, the weight is completely up to you though. Once a pig crosses the threshold of healthy versus obese, it's a grueling process to diet and correct it. 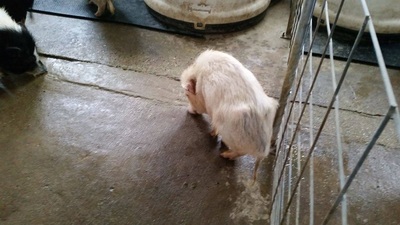 Pigs will gain weight very easily, getting the weight back off? That is a different story. 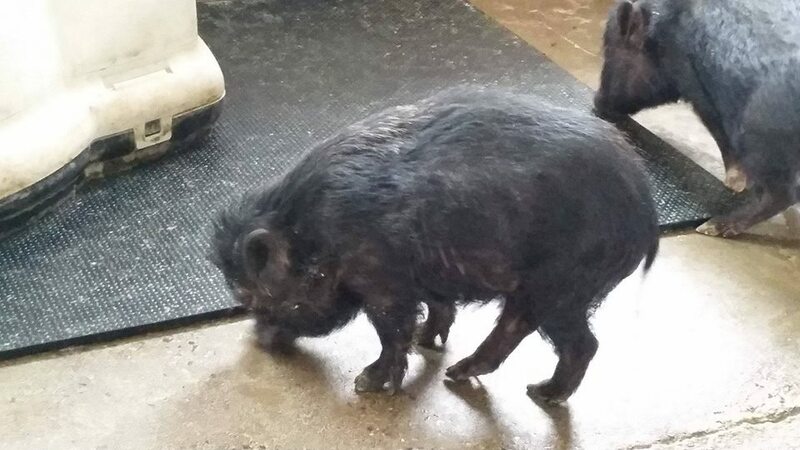 It is a long process to help a pig lose weight once they've reached this point, and sometimes, you will have to involve a nutritionist or vet to guide you on the appropriate way to do it. You can NOT starve your pig to lose weight. This is mean and cruel as well. They still need to eat, their bodies depend on a certain amount of food thats used for energy and the minimum recommended amounts will still be needed to safely diet your pig. 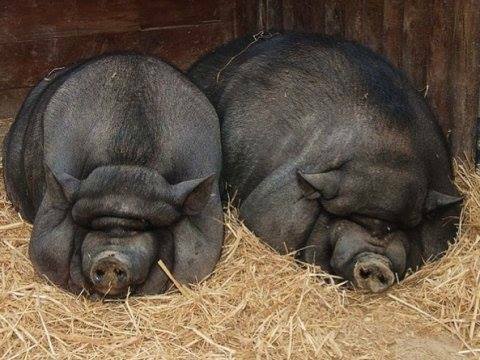 Pigs do NOT lose weight via rigorous exercise. They may occasionally get the zoomies, but that is short lived. ANY exercise should be encouraged, but weight loss takes ALOT of time and doesn't go away nearly as fast as it was put on. I am battling this myself with my very own pig. If your pig is overweight, you are not alone. I am not excusing it by any means, but my pig is on a very strict diet and losing weight every week. Once we get to a point where there is noticeable difference, I will post her before and after pictures to the website, along with her diet. Portion control and types of food are very important if you're trying to help your pig lose weight. You don't need to stop giving treats, but you do have to stop giving them all the time. Treats need to be earned by doing tricks or other active activities, but most of us are guilty of "over-treating". I was recently at a pig seminar and watched Susan from Ross Mill Farms use ONE small treat broken into a lot of pieces, work with a pig with zero training for almost 30 minutes. ONE TREAT. You don't have to give a lot of treats to train. 1/2 or 1/4 of ONE cheerio can do as much as a handful of cheerios as far as positive reinforcement goes. Your pig needs to be encouraged to go outside and dig and play, they need to run (if able) to burn off calories. To accomplish this, sometimes you must go outside and run and play with them. Placing their breakfast or dinner is places around the yard forces them to walk to find it. Some suggest the use of a treat ball to encourage exercise while eating meals. Any exercise is better than no exercise when they're on a diet. This not only allows the pig to exercise while eating, but the body is a wonderfully complex entity. The brain sends a signal to the belly letting it know its had enough to eat and typically when this happens, you are no longer hungry. When pigs eat, they tend to eat fast, when this occurs, the brain doesn't have time to register that its full or enough time to get the signal to the belly. If you scatter food, you force your pig to slow down the eating allowing the brain to send the signal and the belly enough time to get the signal. Adding in low calorie food in addition to the pelleted feed and foods that are "roughage" foods do two things, first and foremost, they help keep the GI tract healthy and moving and secondly, these types of food can also help the belly feel full. Water should always be close by though, they should not have to wander around to find their water bowl. Use several bowls of water if needed, but always have that accessible. Remember, pigs aren't going to lose a substantial amount of weight from exercise, they will lose weight by controlling what they're eating. They will continue to put on weight as long as the amount of calories they're eating exceeds the amount they're burning. Diet must balance activity levels. 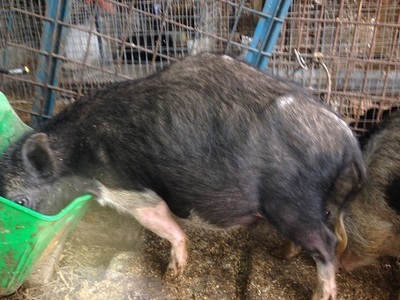 If you notice your pig is gaining weight excessively and developing fat pockets, cut back the feed. Its really that simple. Gaining control early on is key to not having to battle weight loss later on. Link discussing weight loss challenges with a rescue pig who is morbidly obese. 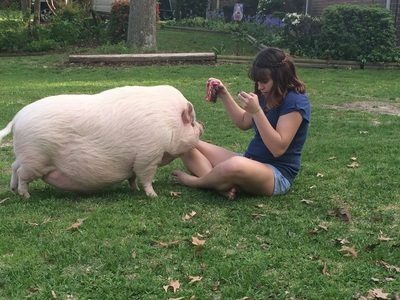 Click here to read about Sweetie the overweight pig. Click here to view our "How to help your pig lose weight" page. 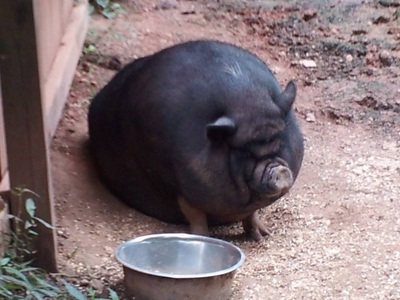 This poor pig is morbidly obese AND pregnant. Oh, also on Craigslist as a rehome. This image has been posted many times in different forums to attempt to describe what healthy versus unhealthy looks like. A #3 should be "ideal" on this chart. This image comes directly from an animal welfare site. Link to site for picture above. click here. 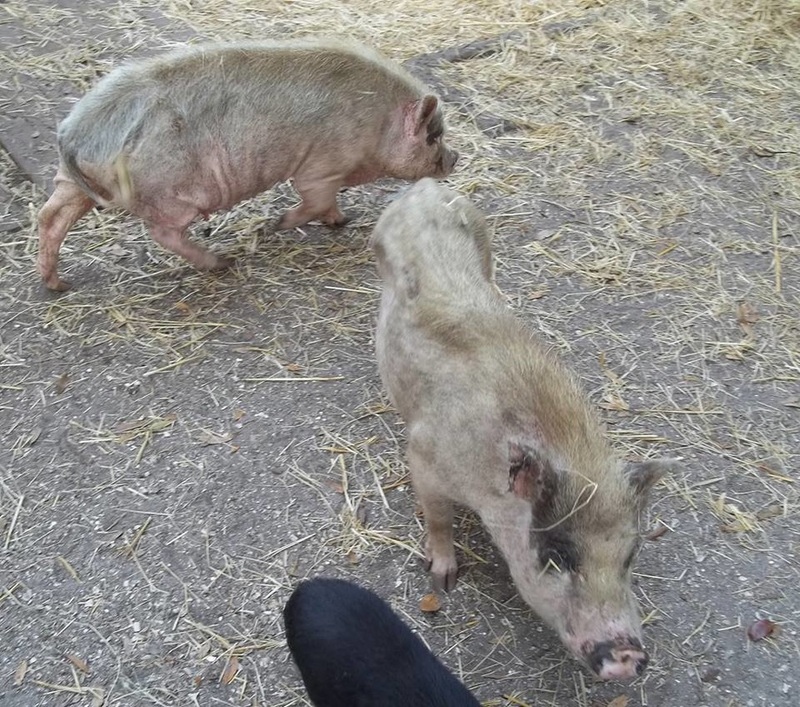 Although potbellied pigs are considered miniature pigs (compared to a normal farm hog) their average weight at maturity is between 90 – 150 pounds although overweight pigs can easily weigh 200 – 250 pounds. 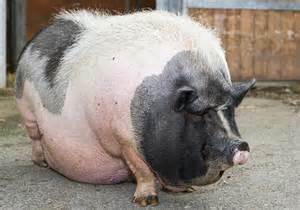 Common problems associated with obese pigs include fat blindness; arthritis particularly of the elbows; dropped pasterns; prolonged recumbency so the weight gain cycle continue; “casting” – some pigs once in lateral recumbency are unable to get their legs under their body in order to rise; changes in attitude and alertness make it more difficult to detect disease; difficulty in transporting the animal and inability to move up and down steps; exercise intolerance; technically more difficult to intubate for surgical anesthesia. 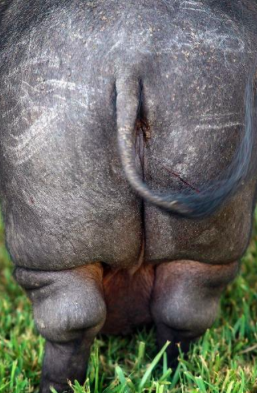 BCS2: Barely visible spine and hipbones. Ribs easily palpable but not visible. Flanks flat (not hollow). Tail head visible. Skin folds on face slightly rounded. Once a pig is overweight weight loss becomes a problem. Dietary adjustment and exercise are important and the only way to reduce body fat. Scattering low caloric snacks such as greens away from where they sleep will be very helpful in stimulating daily exercise.